For regular readers, it is probably clear that I enjoy the fruits of the earth during each and every season of the year. I love the apples and pears of autumn.... I truly look forward to Brussels sprouts, root vegetables and winter squash during the fall and winter months. And the first asparagus (and peas...and lettuces...and new potatoes...) of spring are always a source of great delight. But one of the reasons I look forward to each of these things is that I am always growing a bit tired of what the current season has to offer. It sometimes feels like I've been eating a lot of asparagus by the time it disappears from the market. But this is part of the beauty of eating seasonally: Right about the time you're tired of something, it goes away for the year. Having said all that, I admit that the end of summer is a bit different. 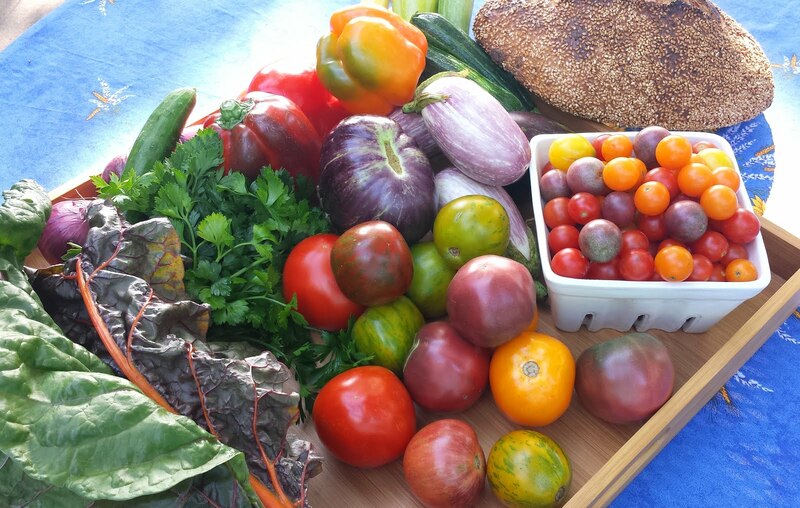 The season of tomatoes, peppers, eggplant, summer squash, sweet corn and peaches never seems to be quite long enough. I was reminded of all of this over this past Labor day weekend as I filled my basket at the market with all of these favorites...purchasing what will probably be too much. I guess I want to milk the season for all it's worth. Peaches are a particular treasure. 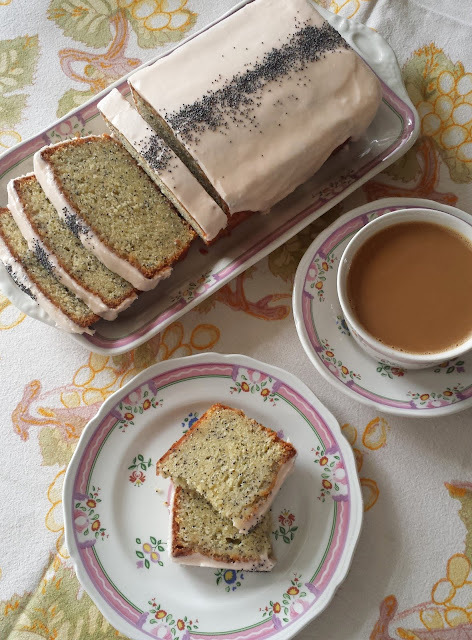 A few years ago I wrote about how I didn't really like them as a child—probably because I had never had a local one during the peak of the season. I'm not sure why this would be since I grew up in Missouri....a state that produces them in abundance. In any case, I love them now. I eat them for breakfast every day until the very end of the season...and tuck them into baked goods of all kinds for as long as they're available. 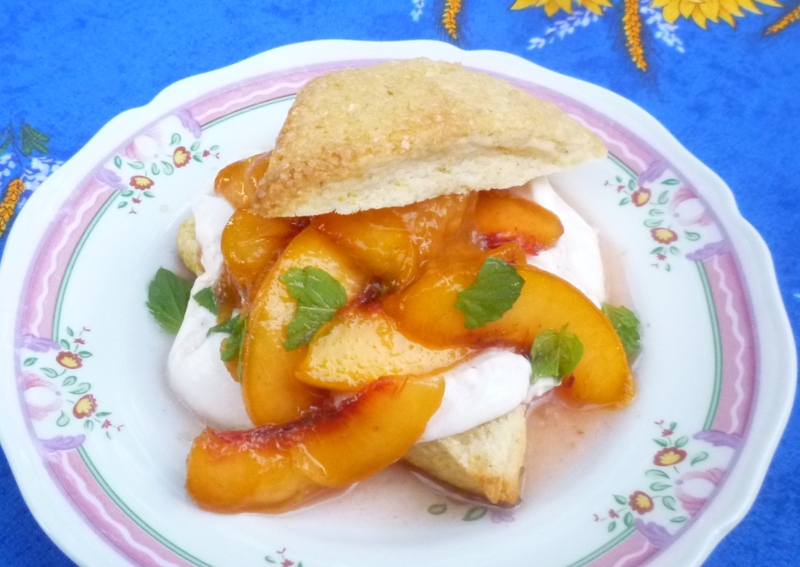 Consequently, when I saw a recipe in Suzanne Goin's Sunday Suppers at Lucques for peach shortcake...featuring a cornmeal scone for the shortcake (I love cornmeal cakes with summer stone fruits and berries...)...I knew it would only be a matter of time before I made it. And I have been making it—and teaching it—for several years now. I haven't really changed her recipe. I have just made a few tweaks: I reduced the cream and leavener in the shortcakes since this produces a better result for me (it's possible this is because Goin's cup of flour is heavier than mine...). 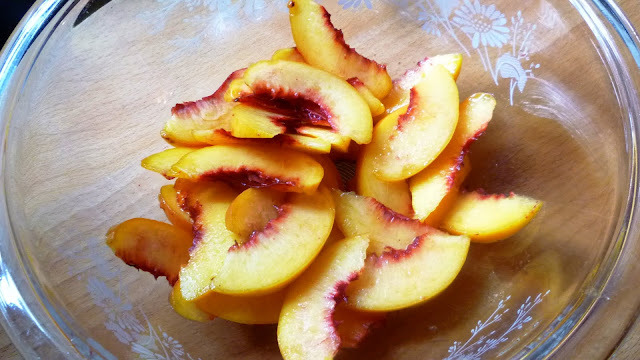 And I add the simple syrup to the peaches while it is still hot and let the peaches chill along with the syrup...producing a syrup that is infused with peach flavor and gorgeous peach color. The main thing I have altered is the recipe for "soured cream". Goin uses mascarpone that she "sours" right before serving with a little lemon juice. I make a cream that is "soured" overnight. I learned to make it while I was at The American Restaurant. It is made in much the same way as crème fraiche (inoculating the cream with a sour culture and then letting it sit at room temperature until thickened), but it isn't really the same. It's actually a bit of a cheater method for making crème fraiche. Since you add lemon juice at the start, the cream starts coagulating—and therefore thickening—almost immediately. 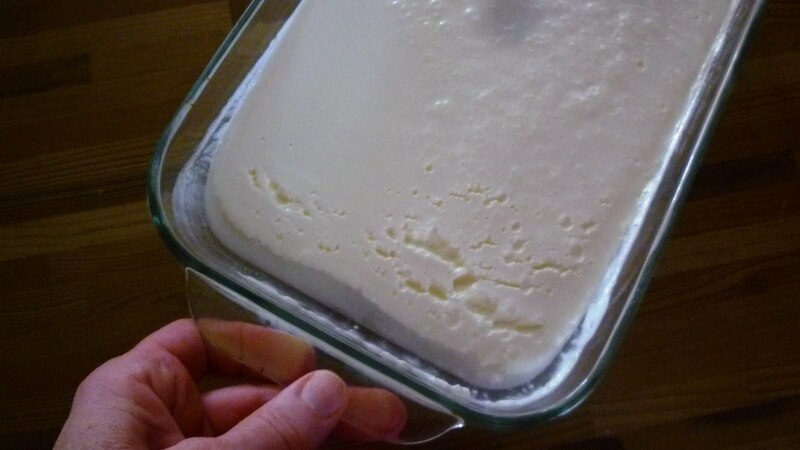 The thickening in crème fraiche comes from the culture in the soured dairy product (not acidity). Typically this culture comes from buttermilk or yogurt. It is supplied by the sour cream in this recipe. But the rather large quantity of sour cream adds more than just culture...it adds body and thickness too. I think the soured cream is delicious with the peaches and cornmeal cakes...but if you don't have time for it you could serve these shortcakes with plain, lightly sweetened whipped cream (or purchased crème fraiche or mascarpone)...or simply a scoop of vanilla ice cream. I realize as I write this that there are only a couple more weeks of peach season left for the year. But for most of us, there are also a few weeks of warm summer-like weather left, too. 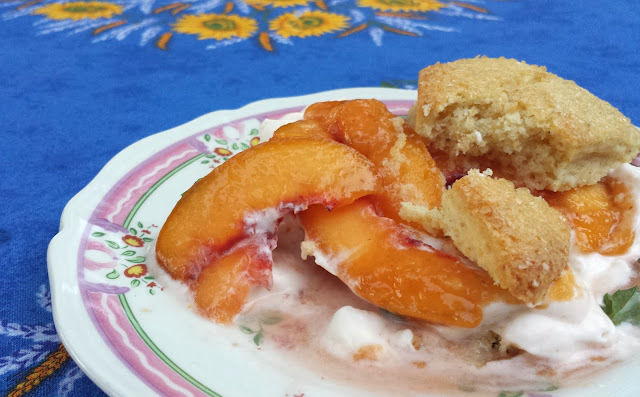 So, on one of the warm evenings that remain, plan on making this...or some other favorite peach dessert. Then you will be able to say that you squeezed every last drop of pleasure out of peach season this year. And if you don't have the time...or an occasion... Or if peaches are already a thing of the past in your part of the world... I am happy to say that as long as the earth and the seasons persist, there will always be another crop of peaches to look forward to. Place the soured cream in a bowl with the reserved 1/3 cup of the syrup from the peaches. Whisk until the cream begins to mound in the bowl. Taste. Add some sugar (anywhere from 1/2 to 2 T.) if the cream is not sweet enough for your liking. Briefly whisk to obtain soft peaks. Don't over whip. Chill until ready to use. If stored for more than an hour, it will probably need to be rewhisked to restore soft peaks. Cut 6 of the shortcakes in half horizontally and place the bottom halves on individual plates. Spoon some of the peach purée over each. Spoon a large dollop of the soured cream over this and then ladle some of the peaches, along with some of their juices, over the cream, letting some of the fruit fall onto the plates. Drizzle some more of the purée over the peaches if you like. Place the shortcake tops back on and serve. Serves 6. At least a day before you plan to serve the shortcakes, combine the sour cream, heavy cream and lemon juice in a small bowl. Whisk until smooth. Cover with plastic wrap and let sit at room temperature until thickened slightly--anywhere from 12 to 24 hours depending on the warmth of the room. Combine the flour, cornmeal baking powder, salt and sugar in a bowl. Whisk to blend well. Add the butter and rub it in to the dry ingredients using your hands or a pastry blender until the mixture resembles coarse cornmeal. Stir the dry ingredients with a rubber spatula while pouring in the cream. Continue to stir and pour, using just enough cream to form a soft dough. Turn the dough out onto a lightly floured surface and knead briefly just to bring the dough together. Pat the dough into a circle 1-inch thick. Transfer the disk to a parchment lined sheet and chill until firm—at least half an hour. Using a sharp knife, cut the circle into 8 wedges. Place the wedges an inch or so apart on an un-greased or parchment-lined baking sheet. Brush each wedge with some cream and sprinkle generously with the raw sugar. Bake at 425° until golden brown and springy to the touch—about 12 to 15 minutes. Note: The shortcakes may be made, formed and topped with cream and sugar the night before. Keep them in the refrigerator overnight. It is not necessary to bring them to room temperature before baking—they may be place directly in a preheated oven from the refrigerator. They may also be frozen raw and baked from frozen—reduce the oven temperature to 375° and increase cooking time to 20 to 25 minutes. Peel the peaches. Halve, pit and slice the peaches about 1/4-inch thick and place in a heatproof bowl. Combine the sugar and water in a small saucepan and bring to a simmer, swirling the pan to dissolve the sugar completely. Pour the hot syrup over the peaches and stir a few times to make sure the peaches are completely coated by the sugar syrup. Chill the peaches until ready to serve...up to an hour or two. Lift out a quarter of the peaches and purée—in the food processor or blender...or, use an immersion blender. Set aside. 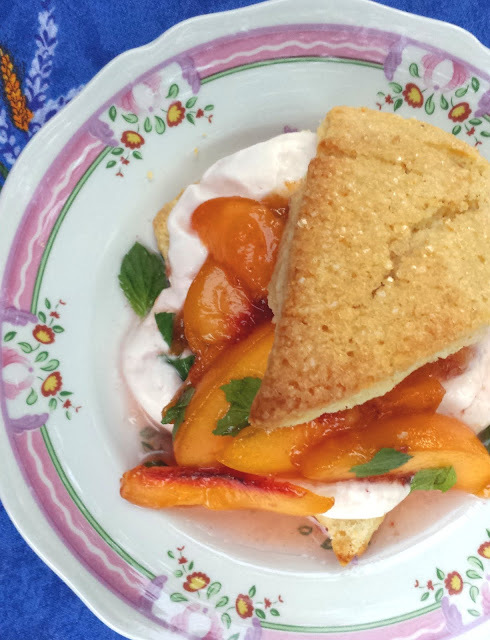 Finally, tear the mint leaves with your hands and add to the peaches. Let stand for a few minutes before using. If your peaches are not quite ripe, you may want to simmer them for a minute or two in the simple syrup. To do so, use a wide, shallow pan to make the syrup. Then, add the peaches and return to a simmer. Let the peaches simmer gently for a minute...maybe two...and then transfer to a bowl and chill. If you don't want your soured cream to have a pale pink cast to it, then hold back 1/3 cup of the simple syrup when you pour it over the fruit. Use this plain simple syrup (chilled) to sweeten the cream.